AOL deal to plug portals? NEW YORK (CNNfn) - The $4.2 billion marriage of America Online and Netscape Communications is seen by some industry observers as blocking the growth of the dominant Internet portal of Yahoo! Inc., and swamping smaller portals that have carved out niches on the Web. With 14 million users, AOL is the largest Internet service provider in the world. But it has faced increasingly stiff competition from Yahoo! and other Internet "portal" companies that portray themselves as "gateways to the World Wide Web." Netscape (NSCP), on the other hand, produces one of the two browsers that allow computer users to view the Web, and has recently re-invented itself as a Web portal in its own right. "The deal could spell doom for smaller portal services such as Infoseek and Lycos," said Rajiv Chaudhri, president of the Digital Century hedge fund. Lycos Inc. has the third-largest audience reach on the Internet, a standing behind AOL and Yahoo! unlikely to be changed by the Netscape merger. The company has concentrated its strategic efforts on the technological elite among Internet users through a relentless pattern of consolidating smaller but trendy Web sites. Over recent months, Lycos has devoured such online hot spots as Wired Digital and Internet "community" Tripod, giving it access to millions of additional users. Because these sites appeal to a more experienced Internet audience, overlap with AOL has always been minimal -- leading industry watchers to predict that Lycos will suffer less direct competition with the Netscape-AOL fusion than other portals. America Online traditionally markets its services to the casual or novice Internet user, who often prefers AOL services to the reputedly confusing and anarchic electronic environment that Lycos cultivates. 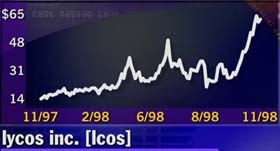 However, Lycos' recent launch of the "Lycos Network" may bring it into direct competition with AOL over audience share. By channeling users from all of its smaller sites into the Lycos Network, the company hopes to maximize audience retention much as a television network serves as a unified media hub. AOL has already spent years building a similar "network" of corporate and media alliances, making its proprietary content a major audience draw. While Lycos retains a sharply electronic focus, fifth-ranked Excite Inc. has followed a more dollar-based growth strategy, emphasizing advertising revenue over online alliances or raw audience growth. The policy produced estimate-topping $44 million revenue in the third quarter, but audience growth disappointed analysts looking for a winner in the battle for the eyes and brains of Internet users. Furthermore, with its alliance with Netscape thrown into question by the AOL deal, Excite is likely to be the portal most directly to be affected by the industry's new configuration. Netscape was Excite's major online partner, with the two companies embarking on a $70 million content-sharing deal in May. The deal was widely touted as Excite's chance to overtake Yahoo! by becoming Netscape's official search engine and advertising sales arm. 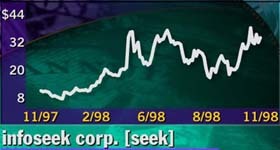 Some market watchers have questioned the future of the alliance, particularly in light of Netscape's decision a few weeks ago to reconsider a similar arrangement with Infoseek Corp. However, the services Excite provided before the AOL-Netscape deal was announced - notably the portal sine qua non, the Web search engine - are also likely to prove useful to AOL. If so, Excite may continue as an unofficial partner in the Netscape-AOL bloc, boosting the company's prospects as a long-term survivor of the portal wars. As the smallest of the major portals, Infoseek might have been thought to be most vulnerable to industry turmoil in the near term. But the company may actually have the least to fear from the AOL-Netscape alliance. The source of Infoseek's immunity is its close alliance with Walt Disney Co. (DIS). In the first entry of a global media player into the portal wars, Disney bought a 43-percent stake in Infoseek a few months ago, announcing that it will collaborate with the company to create a new Web gateway, GO.com. Analysts welcomed the news, predicting "fireworks ahead" for Infoseek. "We believe GO.com will become a ubiquitous on-line brand (similar to AOL or Yahoo!) in a short time frame," Bankers Trust analyst Shaun Andrikopoulos said. Shares of all three smaller portals were down slightly in mid-morning Wednesday trading. 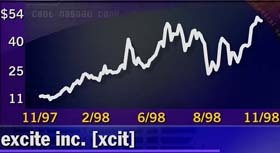 Excite (XCIT) slipped 1/16 to 49, Lycos (LCOS) was down 5/16 at 62 and Infoseek (SEEK) lost 5/8 to 32-3/8. Among the giants, AOL (AOL) was up 1-5/16 at 92-11/16 after Lehman Brothers analyst Brian Oakes raised his price target on the stock to $110 from $75 and said the merger "makes a lot of sense." Yahoo! (YHOO) lost 5-7/16 to 204-13/16.